Do you also like the cosy, homely atmosphere of country interiors? Then choose a matching country stairs and give your interior an upgrade. At Upstairs, you’re at the right place for impeccably renovated country stairs with a top-class finish. Country stairs should exude calm and warmth. That is why it’s best to choose neutral, light colours. Of course you choose a wooden look too, as nothing looks as charming as wooden stairs. At Upstairs, you will create the country stairs of your dreams in consultation with our adviser. This means that nothing is left to chance. From choice of colour to finish: Upstairs will renovate your stairs and create a masterpiece of country charm. Which materials to choose for a country staircase? Wooden staircase covering. 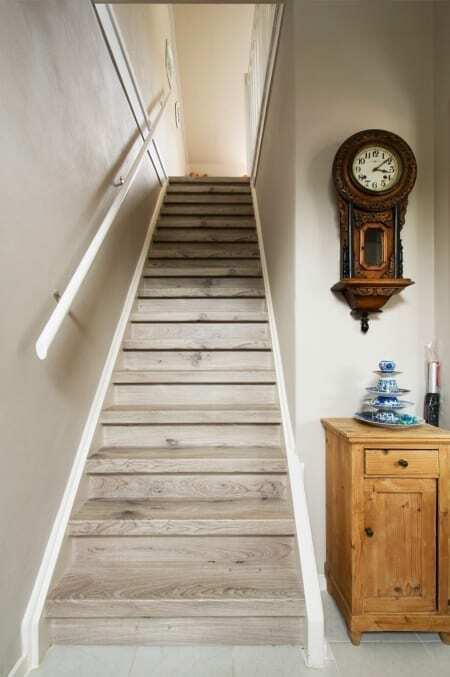 San Diego Oak, Vintage Oak or Complex Oak give your country stairs a classic look. But Mississippi Pine and Capitol Pine will also add the finishing touches to your country scene. Discover all of our wooden staircase coverings in the World Collection. Classic staircase covering. Do you want to give your classic stairs a clear, light look? Then make sure you take a look at our Mountain Oak staircase covering. Black staircase covering. You can also have the opposite: Solid Black is a dark staircase covering that gives a modern touch to any country stairs. Concrete staircase covering. At Upstairs, we also cover your concrete staircase. For instance, you can keep the same atmosphere by using Cloudy Cement and make sure to look at Raja Black and Blue Steel too. Remember, every decor will combine with your concrete staircase! At Upstairs, we keep a close eye on trends in interior design. Our advisers will be pleased to help you create your country stairs. A staircase renovation takes just one day and will give your hall or living room a new, fresh and particularly breath-taking look. Would you like to know more about a country staircase from Upstairs? Do you have a question about staircase renovation or about how to tackle your country stairs? Don’t hesitate to contact one of our members of staff. Do this and you will be taking the first step towards the country stairs of your dreams!